Superdry women’s Saratoga skirt from the Modern Prep range. This limited edition skirt is a key piece to the range, bringing the vision of pretty meets street to life. 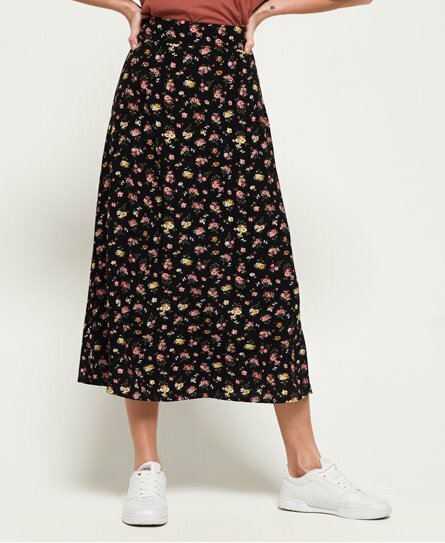 Ditsy, preppy prints have been mixed with urban, relaxed styling to create this perfectly on trend midi skirt. Crafted from a lightweight crepe fabric, this skirt features a side zip fastening and is completed with a minimalistic logo badge on the waistband. Style with an oversized t-shirt for a street, grunge look or pair with a bodysuit for a more feminine vibe.